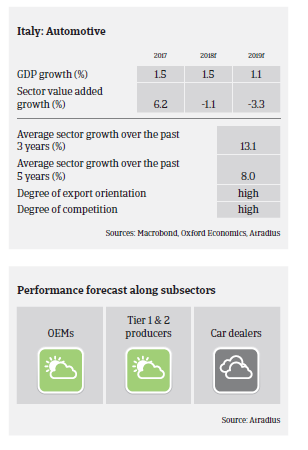 Smaller automotive businesses experienced a decrease in equity, solvency and liquidity ratios - a trend that is expected continue in the coming months. According to the industry association ANFIA car sales increased 6.8% in 2017, due to robust domestic demand and higher exports (more than 50% of cars produced in Italy are destined for export, with France, Germany, and the US as main markets). However, the positive trend slowed down in H1 of 2018, with car registrations in Italy decreasing 1.4%, in contrast to further growth in Europe (up 2.8%). In 2018 the domestic market is expected to remain flat, due to the subdued economic rebound and increased uncertainty after the government change. Potential support for production and sales growth in the short-term future comes from the need to align with emission standards and to replace obsolete models (the average age of the vehicle fleet in Italy is above ten years). Many Italian manufacturers and car part suppliers recorded stable or improving profits in 2017. However, smaller businesses experienced a decrease in equity, solvency and liquidity ratios, a trend that is expected continue in 2018. On average, payments in the Italian automotive industry range from 60 to 90 days and 120 to 150 days, depending on the end-buyer and whether working capital requirements can be financed by banks or suppliers. Generally, payments are quicker when the end-buyer is a foreign company. Payment experience has been rather good over the past two years, and non-payments are not expected to increase in the coming months. The level of automotive insolvencies is low compared to other industries, and business failures are expected to level off. Our underwriting approach remains generally open for the time being. Car manufacturers have a diversified product range and are competitive in both domestic and foreign markets, while Tier 1 producers can rely on the sound creditworthiness of their final customers. However, we are more cautious with small and medium-sized players and tyre distributors/wholesalers, due to fierce competition in those segments.